A great saute pan can become an essential member of your cookware team. A saute pan is like a skillet only it’s wider with straight sides and a lid. It’s obviously good for browning and sauteing meat but is also great for steaming vegetables and making incredible sauces. The straight sides help prevent spilling and the wide surface is great for searing food and for reducing sauces. How do you choose the best pan? There are several things to consider – design, material, handle, surface, lid and size. The following reviews will show an array of saute pans that can help you decide which type of saute pan is right for you. The All-Clad Stainless Steel 3-Quart Sauté Pan is the quintessential saute pan that is ideal for sauting, browning and searing. It has a classic design with a wide surface and straight sides which blocks food from splashing and makes it easy to turn food while it is cooking. The pan features a stick-resistant 18/10 stainless steel interior and it is fused with a three-layer construction including an aluminum core that provides evenly distributed heat to your food. Another great quality is a long handle that is riveted onto the pan and fits snugly in your hand making cooking steady and even. The lid also aids in regulating heat and evaporation. The pan is dishwasher safe although it’s still recommended to hand wash the pan. You may be used to using a regular frying pan but this saute pan has a wider surface and straight sides that will contain all liquids and keep them from splashing while you are turning the food for even cooking. You can use the pans for several types of food allowing you to sear or brown, deglaze or finish the food in the sauce in the same pan. There are two types of handle – a long handle and a loop handle that are both made of stainless steel. The ergonomic handle offers superb and comfortable control while you are cooking. The lid holds in the moisture and heat while the pan is in the oven. All-Clad 4403 is compatible with any heat source, including induction, and is oven safe up to 500°F. Timeless creations, outstanding execution and incredible durability can be found among all the pieces in All-Clad’s Stainless Collection. The Stainless Collection is All-Clad’s most admired collection of cookware. These products all include an interior core of aluminum that is designed for uniform heating and high-polished exterior with a wide surface for superb cooking execution. 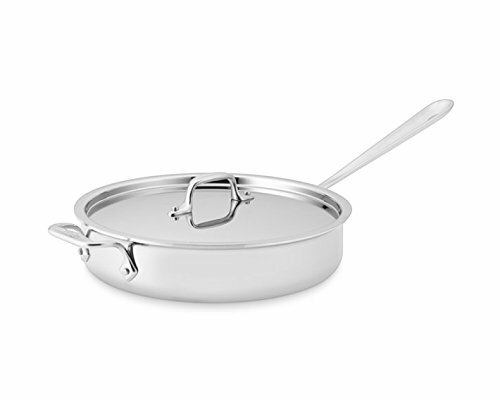 A stick resistant interior finish is featured on all All-Clad stainless steel cookware. The bottom of each pan is engraved with a convenient capacity marking. All-Clad was established in 1971 by founder John Ulam as All-Clad Metalcrafters. He began creating professional-quality bonded cookware for professional chefs and passionate home cooks. As people found out about the superb cooking experience of the product, the brand took off. All-Clad cookware is still created in Canonsburg, Pennsylvania, with American-made steel just as it was made forty years. It is still considered a top brand by professional chefs and avid home cooks. Reviewers are in love with this product. It is a well-made pan that cooks evenly, is easy to clean and is definitely worth the price. This pan is very versatile and can be used in several different ways and for different types of heat and cooking. • Great heat transfer due to aluminum core, surface provides an even and constant temperature. • Best thing next to cast iron. • Can use either acidic or non-acidic food without worry. • Very durable, even when dropped. • No flaking coating or health concern from the materials. • Works on any type of stove. • Can use any type of utensil on it and clean it with a copper pad. Overall, it will save you money over time if you cook a lot. You won’t need to eat out as much as you will be able make healthy, tastier food at home. The company itself also had great customer reviews especially since they are willing to replace pieces, even if they are several years old. Not everyone is in love with the handle. Complaints have included that it is too long, too narrow and not solid as well as uncomfortable when cooking with the pan. It twists and is not balanced properly for how heavy the pan is. There were many complaints about the handle and how wobbly it makes the pan which can be solved if you wrap a kitchen towel around the handle. There were also a several complaints that it doesn’t stay shiny for very long as it also develops brown stains on it after a few uses. The Simply Calphalon Nonstick 5-qt. 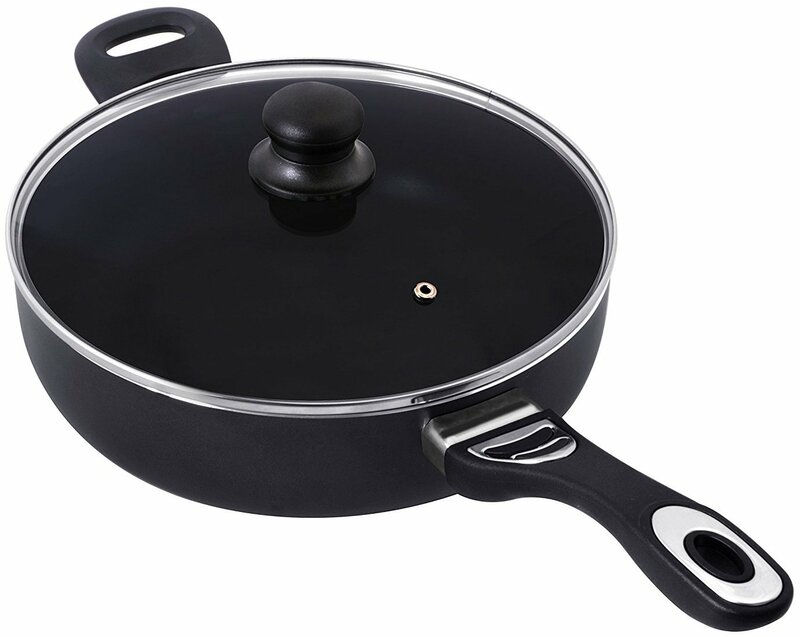 Sauté Pan with cover is made of strong hard-anodized aluminum, a nonstick surface and an easy to hold silicone handle. The long-lasting surface provides a consistent cooking experience with quick and uniform cooking and fast and easy cleanup. The handle is very comfortable and is cool while on the stove. The pan features a large bottom for a wide cooking area and tall, straight sides to prevent fluids from splashing. The large size is perfect for one-pan dinners or sauces. The pan is oven safe to 400° F and has a full 10 year warranty. The pan can be used on any cooking surface and with any type of utensil. This is a great all-around cooking pan that can be used daily. It’s very versatile for frying chicken and then steaming vegetables. It can be used to fry eggs, sauté shrimp, brown ground beef and make incredible sauces. The wide surface makes it better than a frying pan but it’s still easy to move around your stove top and put in the oven. The high sides are great at preventing spillage and messy counter tops. If you’re frying chicken, the straight sides of the pan keeps the oil from splattering on you. The see through lid is helpful when timing your cooking to add vegetables to you one-pot dinner and to help hold in the moisture for steaming. This is a great pan for a family since it’s so large it can cook large meals. And since it’s non-stick it doesn’t require oil so your cooking is healthier. The nonstick surface makes it great to clean, no effort necessary. Reviewers like this product stating that the nonstick pan is impeccable. The size is great for its versatility. Reviewers also like the handle which makes it easy to move a full pan while cooking and it stays cool even when the pan is hot. • Great non-stick cooking and is durable. • Great size and is a good, heavy pan. • No sign of wear even after using for a long time, several times a week. • Great 10 year warranty. • Great every day pan. • Can make so many different dishes from frying eggs and chicken and browning ground beef to steaming vegetables and making sauces – great for one-pot meals for families. • The pan cannot go in the oven up to 500 degrees. • Handle too long and too thin and is uncomfortable to hold . • Pan doesn’t fit in the sink. • Lid does not have a vent so steam releases around the edges. • Meat gets a chemical flavor and odor. • Pan warped within one week although the customer did not submerge it in water after being on high heat. • Does not work well on a glass top stove. The T-fal C03782 has the new upgraded T-fal Thermo-Spot heat indicator which shows when the pan is at the perfect preheated temperature ensuring the flavor of the food is locked in. The pan is made of durable hard anodized construction with Titanium reinforced nonstick coating and a riveted handle that is comfortable, cool and secure. The pan comes with a clear lid and is easy to clean as well as dishwasher safe. It also includes a lifetime limited warranty. The T-fal C03783 pan heats your food evenly and is great for a family and making one-pot dinners. The 5 quart size and wide cooking surface allows you to cook large amounts of food without the need for oil and butter which makes your meals healthier and more flavorful. The pan is versatile for all your cooking needs including frying, sautéing, making sauces, one-pot dinners and steaming vegetables. The high straight sides help to retain all the sauces simmering inside helping to prevent splash over and creating a messy stove top. • People that have purchased this pan love it and use it daily. You can cook almost anything in the pan and nothing sticks to it. • The T-fal C03782 holds up better than more expensive alternatives. • Allows you to cook large quantities at one and cook healthy food without needing oil or butter. • It’s easy to maneuver with the silicone handle on the stove top. • The pan is easy to wash with just soap and water. 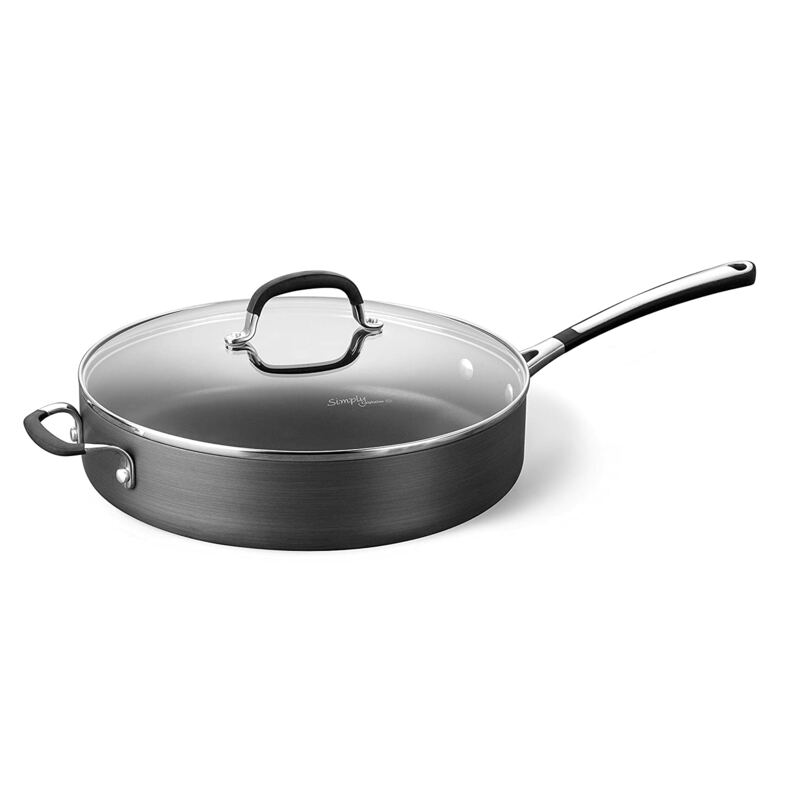 • Excellent pan at a great price, very comparable to high-end sauté pans. • Very durable and sturdy construction. • Includes a lifetime limited warranty. • Handle stays cool while the pan is hot. • You cannot actually get 5 quarts in the pan, 4 quarts fills it to the rim. • Handle is not attached very well. • Nonstick surface wears off quickly. The Utopia Kitchen Professional Nonstick 11″ inch Jumbo Cooker, 3.4″ inch sides, 5.5 Quart capacity is a professional quality pan. It’s constructed of 3003 Aluminum Alloy which is used for professional grade cookware. It has a modern design that is an elegant addition to your kitchen and ensures uniform heating. The Utopia Kitchen Professional Nonstick 11-inch Jumbo Cooker has a 2-Layer nonstick interior that is very durable and scratch resistant. It is safe to use with metal utensils and is safe for any type of cooking method, including stove top and oven cooking. The Utopia handle is heat-safe and very comfortable to use. The pan is easy to clean and dishwasher safe. A paper towel or sponge can usually remove any leftover food if you prefer hand cleaning it. There is also a 30 day money back guarantee in case you just don’t love it. For the price, it’s a great value for a professional, top-rated sauté pan. People who purchased the Utopia Kitchen Professional Nonstick 11-inch Jumbo Cooker loved the quality that they got for the price. It’s a great looking pan that is easy to clean and very versatile. Reviewers found that it cooked meat very evenly without having to move food around in the pan. The clear lids fits perfectly and helps steam food at the same time. The nonstick surface is easy to wash even after you have used grease. • Great looking pan with a great nonstick surface. • Cleans easily by just rinsing it. • Sturdy handle and pan is well-made. • Pan heats very evenly and is huge making cooking large quantities easy. • Great for cooking casseroles in the oven. • The pan is very thin. • Do not use on glass or ceramic stove tops. • Handle is not assembled securely; you have to screw the handle on yourself when you get it. • Pan bends very easily and scratches easily. There are different materials that the pan can be made from such as cast iron, aluminum, stainless, copper, non-stick and combination various materials. There are different theories on what material a good pan should be made of. Each of the different materials is good for different things. You want to make sure that your pan is reactive to heat so it heats up quickly and cools off quickly too. This ensures that the pan is conveying heat well so that the food is cooking uniformly and resourcefully. The pan should convey heat equitably throughout the bottom of the pan and up the sides. Heat is conducted differently from metal to metal so it’s important to get the type of pan that works well with your cooking style. Copper is the best choice for conducting heat but it’s a lot of work to keep it polished. Aluminum is also a great choice with less up keep and still gets good conductivity. At the very least, make sure the pan is made of heavy gauge metal and has a thick bottom. Don’t purchase a pan with a thin bottom, the pan will then cook unevenly and get hot spots. The design of the pan is also very important because you want it to be wide enough that the food is not overcrowded. The food should brown evenly and not burn or steam and become soggy. The pan should also a have a flat bottom to make it simpler to glide back and forth on a burner. A flat bottom will also ensure that the heat is evenly dispersed and will cook the food evenly. The sides must be straight which keeps the food from splashing out and it also helps keep the food in when cooking and pan jumping. Also, the sides need to be low enough to help distribute air which keeps the food from becoming soggy and the pan from becoming too heavy. Pans come in various sizes from a single quart up to seven quarts. Depending on your needs, you can find one that’s just the right size for you. You can also purchase them individually or in a set. Depending on your budget, you may be able to purchase an entire set right away or you might need to purchase them one at a time as you can afford them. If you buy them singly, and you accidentally purchase a cheap one or are not happy with your selection, then it’s easier to change the type with your next purchase. There are also always new products that come out as well so purchasing them singly allows you to buy the newest cookware with all the newest materials, features and designs. You definitely need a long handle for your pan. This helps you glide the pan around on the burner, flip food and just get some great general movement while you cook. You also want to be able to move the pan into the oven while you cook and a long handle makes it much easier to do this. Make sure you have a pan that is well built with a strong handle that won’t come off. You may want to check for heavy screws holding the handle on. Some of the new pans feature handles that don’t get hot which makes it easier to move the pan from different locations although keep in mind wooden handles can’t be used in the oven. A sauté pan is a great addition to your kitchen. They are very versatile and are great for serious cooks, professional chefs and for families. If you love to cook or cook in large amounts, you will really enjoy the ease of cooking with a sauté pan. Heat is distributed evenly over the large surface and the high sides keeps all the food in for a cleaner stove top. Sauté pans are great for frying, sautéing, steaming, one-pot meals and making fabulous sauces. There are a variety of pans to choose from with different designs and price point so it will be easy to find the pan that is just right for you. If you enjoy cooking, you will enjoy it so much more with a sauté pan!